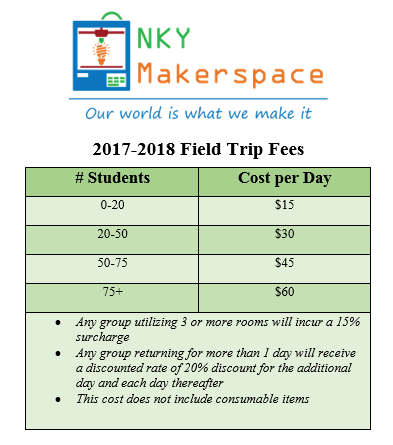 We offer field trips for certified teachers and K-12 students in northern Kentucky and greater Cincinnati at minimal cost. We are fortunate to have the financial support of Boone County Schools, the Boone County Education Foundation, and a number of major sponsors including Toyota, Perfetti Van Melle, R.C. Durr Foundation, Monoprice, Gorilla Maker, and Dr. Randy Poe. At the MakerSpace, we believe field trips should be planned to be an extension of the classroom. We encourage teachers to schedule a time to explore our space and technologies prior to planning a field trip in order to prepare for a best-practice learning experience for all students! Note: We do not have a staff of teachers, so this exploratory time is critical when working with and teaching with cutting-edge technology!